According to Houzz’s latest survey, almost half of homeowners are concerned with curbing their energy consumption (42%). One way in which Australian homeowners are curbing their energy consumption is by using outdoor shades. These provide a cool relaxation area thereby reducing the need to spend time indoors and in air conditioning. There are several shade solutions available in the market today, but one option which really adds beauty and functionality to the home is the aluminium awning. This shade option is slowly gaining popularity all over Australia. As shade designers and manufacturers, Global shade has installed several aluminium awnings on the Gold Coast and in other parts of Australia. There are many reasons why this shade solution is becoming a favourite among homeowners and in this article, we will share some advantages with you. Aluminium awnings have insulated layers that deflect the heat from the sun, keeping you cool on a hot day. The insulation also dulls the noise of rain, giving you a feeling of being protected once you are beneath it. Aluminium awnings are an investment. Aluminium is a strong metal and can withstand strong winds and storms and because the sheets are screwed on tightly on beams and braces, they remain sturdy no matter the weather. 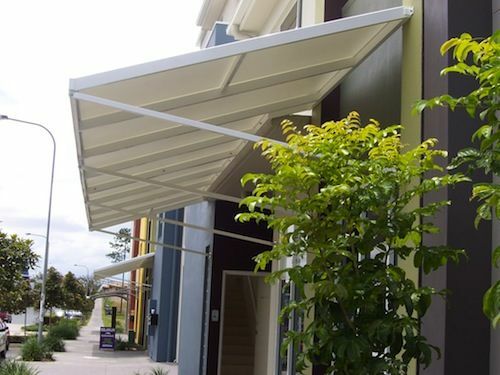 Aluminium awnings on the Gold Coast are particularly useful because of the unpredictable weather. Whether it’s the sweltering heat or sudden showers, you can always take shelter and get adequate protection from the elements. Aluminium awnings are easy to maintain and cleaning is much easier than with other kinds. Water droplets from rainfall roll off the awnings with ease and don’t form a pool on it. Maintenance is always a major problem with shade structures and those that need lots of maintenance often lead to higher costs in the long run, which is why this is such a major advantage for aluminium awnings. If you are installing aluminium awnings on the Gold Coast or in any location by the ocean, you do not have to fear corrosion, which is a very real problem from the salt in the air. Aluminium awnings are non-corrosive and if you buy yours from Global Shade, you are sure of aluminium awnings made from the highest quality materials that meet standards. Aluminium awnings act like an extension of your roof and so you can get them custom made to fit in perfectly with the existing roof. Apart from that, you can get skylights installed or a ceiling fan, or even solar panels. A good aluminium awning is more or less another part of your home. It really doesn’t matter if your patio is large or how small, your aluminium awning can be custom fit to any specification. A good installer should be able to measure and install your awning to the exact size of your patio. There are many shade solutions available but aluminium awnings are gaining popularity because of the benefits they bring. Some of these include insulating layers, durability and protection from the elements. Furthermore, they are low maintenance, are corrosion free, act as an extension of your roof and can be built to size and design. When choosing your aluminium awning, you should use a company that can create the design of your choice and install it perfectly to suit your existing space and the style of your home. Contact us today for quality and affordable aluminium awnings on the Gold Coast.